In the late 1880s, a young man named Frank Vlchek emigrated to Cleveland from the present-day Czech Republic. His first encounter with the Cuyahoga River was so notable he found it worth describing in his autobiography forty years later. “Smoke and dirt and flame and pollution – that was all progress, and progress was good,” said John Grabowski, senior vice president of research and publications at the Western Reserve Historical Society’s Cleveland History Center. Even before Vlchek’s time, the river was seen “as a kind of utility,” Grabowski noted. Native Americans and then early European settlers had used the river and then the canal created from it for transportation. But by the industrial age, the “utility” view of the river had reached a new height. By Vlchek’s encounter with it, “the river is a transport device to get coal, iron, iron ore and so forth, and it’s also a sewer, to get rid of things; it’s a waste disposal system,” said Grabowski. Dams built from the mid-1800s to the early 1900s provided water for industry and for drinking, for mechanical power, and then power generation. This “utility” view of the river has been changing, of course. 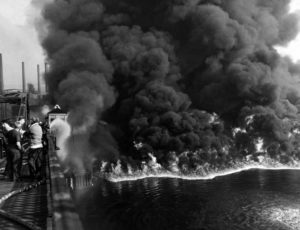 The infamous 1969 Cuyahoga River fire marked a turning point. Fires had been breaking out on the Cuyahoga roughly once a decade since the 1860s, but by 1969 both the national press and Cleveland Mayor Carl Stokes could see that river fires were no longer regarded as a normal side effect of doing business; instead, rising environmental consciousness made a burning river look grotesque. That allowed Stokes, TIME Magazine and others to hold up the relatively minor 1969 fire as a powerful symbol of a national pollution problem. This helped spur landmark environmental protections of the 1970s, including the Water Quality Improvement Act, the Clean Water Act, the Great Lakes Water Quality Agreement with Canada, and the creation of state and federal Environmental Protection Agencies. The burning river also helped inspire the first Earth Day. A new vision of the proper state of a river was taking hold. 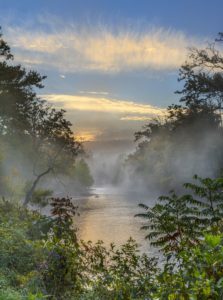 This year, the Conservancy joins the local community in celebrating the 50th anniversary of that infamous day, and the extraordinary transformation of our Cuyahoga River. Throughout the year, you will see hundreds of events commemorating the anniversary, with the pinnacle of events taking place from June 19-23. Be on the lookout for updates on ways you can join our celebration.